Having served as a pastor for years, I had called on people with Parkinson’s. I felt great empathy for those whose speech had become so soft it was hard to understand them, whose movements and tremors were beyond their control. I had been grateful for the opportunity to show empathy for others. But I had no desire to be on the receiving end of empathy–to see sadness and pity in the glance of others. 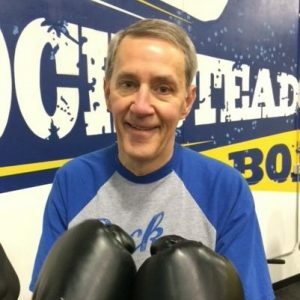 My neurologist mentioned there was this boxing program, and that the rigorous exercise might help delay or diminish my symptoms of Parkinson’s. While I had enjoyed physical activity growing up, I was never drawn to boxing. As a pastor, I tried to encourage others to reason with and love one another – – not to step outside and fight it out! But when my local hospital announced they were starting a Rock Steady Boxing program at their rehab center, I was in the first group of six that showed up on opening day. I was impressed right off the bat with coaches who seemed to care for me and each person present. None of them were like a drill sergeant. They were enthusiastic, complimentary, and in a pleasant way tried to push us to do the best we could. They never demeaned or made fun of anyone. A benefit of participating in Rock Steady Boxing (RSB) was to realize we weren’t the only one with Parkinson’s. In fact, we were the majority, and the coaches were in the minority! When a diagnosis of Parkinson’s is first received, some don’t personally know anyone else with this disease and its unique symptoms. It’s not uncommon for those diagnosed with Parkinson’s to face some depression. Embarrassment from tremors and other symptoms tend to make those with Parkinson’s (“Parkies”) hesitant to go out in public. Staying in and isolated only makes the depression worse. It may become a vicious circle. From the first time a Parkie comes to RSB, he or she doesn’t feel alone. Around you are a number of others facing the same challenges. I met Craig at my first RSB workout. Craig was older than me, and less mobile. In fact, Craig had a physical therapy belt around his waist. He needed a belt and someone else to help him get up from the floor mat and the stretching and exercises we might be doing. Craig was as nice a man as you’d want to meet. Limited as he was, the rest of us could see how hard Craig was working. Just before our closing huddle where we join hands in a circle and shout “Rock Steady!” I commended Craig for how hard he was working, saying he inspired us to work hard as well. His voice broke and tears came to Craig’s eyes. Moist eyes could be seen around the circle. In a relatively short period of time, Craig could get off the floor without the belt! And the rest of us began to feel stronger and more hopeful! We came to see we were more than “victims.” We could help others, and help ourselves! I’ve been working out over two years at RSB and it has definitely helped me. Parkinson’s symptoms, such as tremors, balance problems, and stiffness, can lead a person to lose confidence in the body they once took for granted! There is a temptation to want to sit in a recliner, and limit physical activity to operating the remote control! But the RSB workouts are making me feel stronger and in better shape than I have been since I was in my twenties! The combination of medications prescribed by my doctors and physical exercise encouraged by RSB has diminished my tremor, improved my spirits and confidence, and slowed the progression of the disease. I’m not a masochist–I wouldn’t be doing all this exercise if it wasn’t helping me! So many wonderful drugs have been discovered in recent years that many tend to presume that overcoming a disease is just a matter of waiting for the next miracle drug. The individual hoping for a cure passively sits back and awaits a cure. RSB is based on another premise: Although medications can be of help, we cannot remain passive spectators.